We all know how hard it is for any given mobile game to get noticed in the incredibly crowded App Store, and that becomes even more of an issue when it’s an indie who can’t market too far outside of their local sphere. I sometimes wonder how many fun games are out there, unnoticed by the world at large. 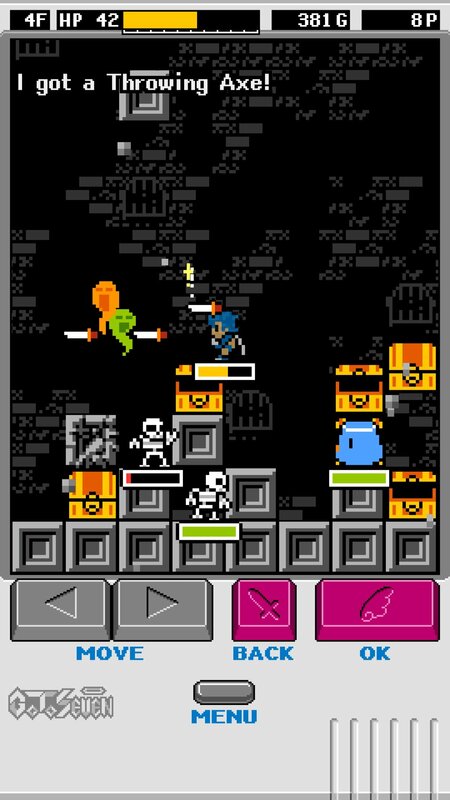 Well, here’s one that I think is slipping past English mobile gamers: Pandoraid (Free). The work of Japanese indie developer Atsushi Kawaguchi, it’s an enchanting fusion of falling block avoidance (a la the dearly-departed The Blocks Cometh) and roguelite elements. The core gameplay is fun and there’s plenty to like, making for a game well worth your attention. There’s not much of a story here. You play as an adventurer trying to ascend a tower full of monsters. As soon as the game starts, blocks begin to fall. Some of them are solid blocks, while others will crumble and spawn a monster. Chests will also fall from above, containing coins, items, and other surprises if you can reach them and open them. If you survive long enough, you may see other things drop from above, but few of those things are pleasant. After a certain number of blocks fall, the layers will begin flashing, signifying that you’ve reached a new level. The gaps will be filled at this point, so you’ll want to mind that you’re not occupying one of them. Before the next batch of blocks begins to fall, you’ll be able to check out a shop or examine the many grave markers littering each floor. When you begin the game, you’ll only be able to choose one character, but as you play you’ll accumulate points that can be used to unlock a ton of others, each a little different from the last. While playing, you’ll come across a bunch of different kinds of weapons and items, adding further variety to the game. Besides the broad weapon types, you’ve got your standard dungeon crawl/roguelike variety of differing parameters and attributes on each and every piece you pick up. Sure, that cool new sword you found may have some power backing it, but those throwing knives with a knock-back capability will be worth their weight in gold in the long run. If you don’t find anything cool, the shops usually sell some decent weapons. As in most Japanese-style roguelikes, you’ll slowly regain your health as time passes, so as long as you can avoid taking a whole lot of damage at once, your health can hold out for a while. By the way, a block falling on your head? That qualifies as a lot of damage at once. If you find yourself in a pinch, you can restore some health if you have the right items on hand. Every five floors or so, you’ll find an inn instead of a shop, allowing you to completely rest and probably even pick up some health-restoring items. As you climb higher, you’ll find yourself having to deal with more monsters, stronger monsters, and a bigger mix of said monsters. If you’re not prepared with the right stockpile of goodies, your chances of survival aren’t great. You’ll also need to make sure you stay fed. Your belly is constantly emptying as you fight off the hordes and hop from block to block, and the only way to fill it up again is with food. It’s usually not a problem, but it’s important to remember to eat now and then. Most of the business with equipment and items is handled via a menu that you can bring up at any time using a virtual button. When you’re not using items, you’ll be moving back and forth using virtual arrows, jumping with a virtual button, and either using another virtual button to swing your weapon or just setting it so that your character auto-attacks like a smart little beaver. 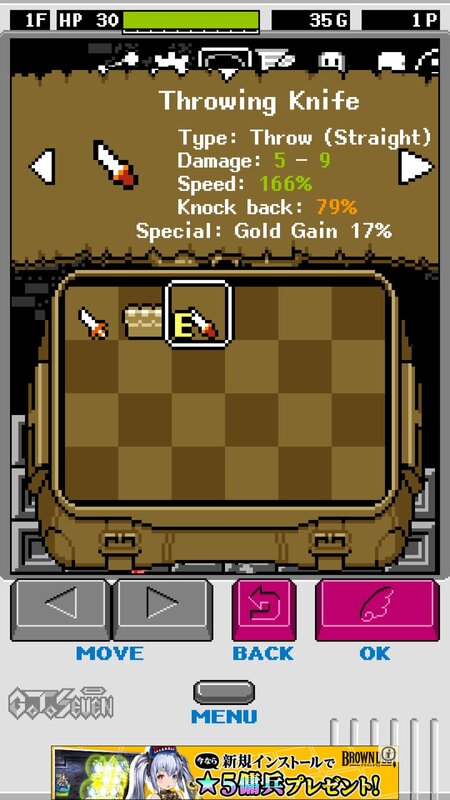 The game is played in portrait mode, so if you remember how The Blocks Cometh played on iOS, you can probably imagine how things work here. Having to constantly go into the menu to do things isn’t the most elegant of solutions, but I suppose there isn’t really any other way to go about it. The game controls well for the action bits, at least, and I reckon that’s where it was important to get things right. Pandoraid is free to play with ad support, and there’s unfortunately no IAP available to disable those ads. You won’t be seeing them all that often apart from the ever-present banner at the bottom of the screen, at least. When you die, you can choose to continue from the beginning of the level rather than starting over if you like, and should you choose to do that, you’ll probably find yourself watching a video ad. You can also voluntarily watch an ad to halve the prices of items in shops. In one of the more unusual quirks of the game, you can also choose to watch an ad to leave a grave marker behind on the floor that you died on. It has your name and how you died on it, and other players will be able to see it. I’d like to note that I could probably stretch that small point into a Dark Souls reference, but I want to believe we’re beyond that now. As much it’s kind of a bummer that you can’t pay to get rid of the ads, Pandoraid is still a really fun game that will keep you playing for a good long while. The retro-style visuals and chip-tune soundtrack are great at evoking a vintage feel, the controls work well, and the unlocks are both enjoyable and meaningful. The grave markers add a small social element to the game without being intrusive, and the smattering of roguelike aspects help things stay fresh each time. If you’ve been looking for something vaguely reminiscent of The Blocks Cometh to fill the gap it left, I think you’ll find Pandoraid does the job with aplomb.